Glascott’s Salon, voted one of 18 of the Best Neighborhood Spots by Chicago Magazine! While the South Side Irish sling Jameson at Cork and Kerry, North Siders head to Glascott’s, the family-owned pub (four generations!) with one of the best St. Patty’s Days in the city. Order the Glascott special: Stoli O vodka, cranberry juice, and Red Bull. Glascott’s Saloon—also known as Glascott’s Groggery—has been quenching thirsts since 1937, and is still owned and operated by a never-ending supply of Glascott’s (Four generations). The Glascott’s have been in the groggery business since the late 1800s, including one Glascott that formerly owned a bar that is now Irish Eyes. Joining nearby Kelly’s Pub and Burwood Tap, Glascott’s is one of the oldest bars in the area, over which time it has acquired a reputation of being the place where hundreds (if not thousands) of couples have “hooked-up” or had their first date, leading to marriage and the inevitable move to the suburbs. Glascott’s also throws a huge St. Patrick’s Day party, pulls a mean pint of Guinness and hosts some pretty wild parties in the back room. 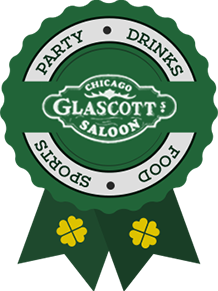 Voted one of Chicago’s BEST St. Patrick’s Day parties, there’s no shortage of Irish cheer at Glascott’s on St. Patrick’s Day, where bagpipers and a leprechaun sighting complete the scene. Glascott’s is also listed on beertravelers.com and realbeer.com as one of the best Irish pubs to drink in the Midwest!